Wilfrid Laurier University is known to be one of the top sports schools in Canada, and with good reason. Laurier varsity teams are always competitive and Golden Hawk athletes continue to make headlines even after graduation. So far, 2019 has been no different for former Laurier athletes. Liz Knox, one of the greatest hockey players in Golden Hawk history, captained Team Gold at the Canadian Women’s Hockey League (CWHL) All-Star game on Jan. 22. Knox and Team Gold won the All-Star game in emphatic fashion by a final score of 8-4. This was Knox’s first CWHL All-Star game appearance and fans voted the Markham Thunder goalie as one of the two captains. Knox had an illustrious Laurier career, to say the least. During her five-year tenure as a Hawk, Knox logged over 5,900 minutes for the Hawks, while posting a 0.960 save percentage. 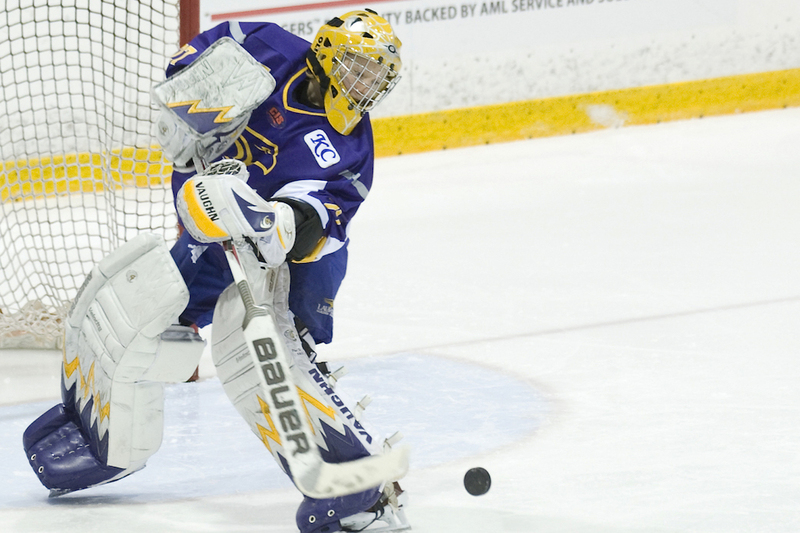 Knox was a key part of four OUA championship winning Golden Hawk teams during her time at Laurier, and she capped off her purple and gold career by winning the CIS Player of the Year award in 2010, becoming the first Laurier women’s hockey player ever to accomplish the feat. The championships began on Jan. 27 and they will end in early February, with the women’s final taking place on Feb. 2 and the men’s final taking place on Feb. 3. At the professional level, Knox’s phenomenal play was rewarded in 2018 as she led the Markham Thunder to their first ever Clarkson Cup trophy last year. This season, the Thunder hold a record of 10-8-3, which puts them fourth in the CWHL standings. After a tremendous 2018, Golden Hawks everywhere will be hoping that Knox can have even greater success in 2019 as she hopes to lead her team to a second Clarkson Cup. Hockey isn’t the only sport where Laurier alumni are tasting success; 12 former Hawks are also competing at the 2019 Ontario Provincial Curling Championships. Out of the 12 former Hawks, there are seven women’s and five men’s curlers. The seven women include Chelsea Brandwood, Brenda Holloway and Riley Sandham competing for Team Brandwood. Hollie Duncan, Laura Hickey, and Cheryl Kreviazuk as a part of Team Duncan, last year’s champions, and finally, Megan Arnold as a part of Team Horton. The former Laurier men’s curlers feature 2018 Olympian Brent Laing who will compete for Team Epping, Aaron Squires playing for Team Bice, Fraser Reid playing for Team Thomas, Jordie Lyon-Hatcher playing for Team Dew, and Shane Konings playing for Team Deruelle. With the men all competing for different teams, it will be exciting to see which Laurier alumnus the last one standing. The winners of the championships will represent Ontario at the 2019 Tim Horton’s Brier and Scotties Tournament of Hearts in Halifax.